When you specify the language of web page you make it easier for screen readers to properly read the content to people who speak languages other than English. In Dreamweaver, you can specify a language for the entire page or for specific sections of the page. Switch to Code View by selecting the Code button at the top of the screen or choosing View, Code. Dreamweaver should provide hints as you type to let you know what you should type next. 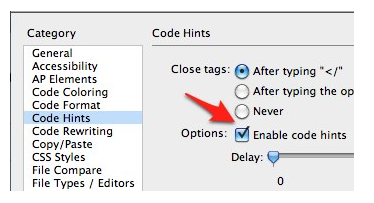 If code hinting is not turned on, choose Dreamweaver, Preferences on the Mac or Edit, Preferences on Windows and make sure “Enable code hints” is selected in the Code Hints section.